Tickle your taste buds with this delicious, nutritious, and filling smoothie. Breakfast, lunch, or healthy snack – this smoothie has you covered. In this third installment of oatmeal based smoothies I bring you this strawberry treat. Strawberries are just coming into season here in Michigan which means I need clear out those stragglers in my freezer from last year to make room for a fresh crop. Here’s a quick rundown of the health benefits of this smoothie. High in vitamin C, manganese, and fiber, strawberries are good for your cardiovascular system, impart antioxidant, anti-inflammatory, and anti-cancer properties, and help regulate blood sugar. Oatmeal is also high in fiber, helps stabilize blood sugar, supports a healthy heart, and imparts antioxidant properties. In addition, oatmeal is an immune system booster, lowers cholesterol, and is an excellent source of magnesium. It’s important that you properly prepare your oats before consuming. 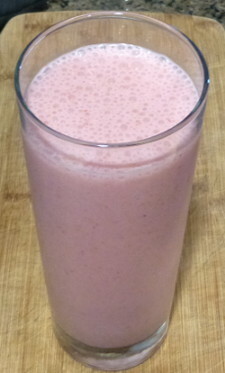 See my Fruity Oatmeal Smoothie which contains simple preparation instructions to maximize nutrition and digestibility. This recipe is pretty basic. Feel free to incorporate one or more of the optional add-ons or any other ingredients you have on hand. Enjoy! I’d love to know if you try this strawberry oatmeal smoothie and how you liked it. Please leave a comment below. Happy Blending! Hello Ryan I have a question how do you determine the calories and %RDA for your recipes? and what is the average serving size of your smoothies. Thank you for recipes they are great start up for new people like me. I use a nifty website to determine calories and RDA percentages: http://www.cronometer.com. It’s entirely free for anyone to use and track nutritional info. Each smoothie is one serving size, which varies by person depending on factors such as age, weight, lifestyle, and health goals. I advise people to adjust the portions based on their personal preferences. We had some oatmeal left from dinner last night (yes, sometimes it’s dinner) so I used it with a couple modifications. I used 1/2 cup dark sweet cherries and tbs. Goji berries an 1/2 cup strawberries. I used the 1/2 tbs cacao, some spinach and sprig of cilantro, 1/2 tsp cinnamon. Since made it for wife and I, used 2 cups unsweetened almond milk. It was great. Sounds like a real winner, Ron! We might have to give it a name – Ridiculously Delicious Ron Smoothie! Hi,I am deffinately going to try the strawberry oatmeal smoothie asap after I go grocery hshopping to buy the ingredients to put in your smoothies in my blender. I love eating oatmeal for breakfast but I have never tried putting it in a smoothie. I think you’ll find oatmeal blends quite well, Kim. hi,I now have all of the ingredients for the strawberry oatmeal smoothie and tomorrow morning I am going to make this smoothie and I will let you know how much I love this smoothie.